Exhibitions on display in the Department of Rare Books and Special Collections can be viewed during its regular hours . Displays in the Great Hall can be viewed whenever Rush Rhees Library is open. Directions to Rush Rhees Library can be found here. From 1837 to 1901, Queen Victoria ruled a British Empire that grew to span a quarter of the globe and include some 450 million people. Her reign coincided with a period of extraordinary social and technological change—and a revolution in visual culture. Images of Victoria were ubiquitous. Broadsides, weeklies, literary annuals, newspapers, engravings, souvenirs, postage stamps, coins, and photographs brought the sovereign, and the monarchy, into peoples’ homes and lives, and shaped their expectations of and responses to the real and figurative Queen. Rather than a history of the nineteenth century, the British Empire, or Victoria’s reign, this exhibition is a look at ‘framed’ imagery, for Victoria depicted was Victoria defined. It is on view through October 5, 2019, in the Department of Rare Books and Special Collections during Department hours. It is on view through October 5, 2019, in the William Henry Seward Room; Department of Rare Books and Special Collections during Department hours. This exhibit commemorates and celebrates the 10th anniversary of the University of Rochester’s Open Letter Books and the transfer of its archive to the Department of Rare Books, Special Collections, and Preservation. Dedicated to publishing translations of international fiction, poetry, and essays for English-speaking readers, Open Letter increases access to works of world literature by opening cultural borders through the broadening of access to readers of English. The Open Letter Books literary manuscript collection includes drafts, publicity, proofs, and other documents that will shed light on the important work of this active press. Connected with UR’s Literary Translation Studies program, many UR affiliates translated works published by Open Letter Books.This is exhibit was guest curated by Kristen Totleben, Modern Languages and Cultures Librarian. It is on view through March 16, 2019, in the Friedlander Lobby of Rush Rhees Library during library hours. 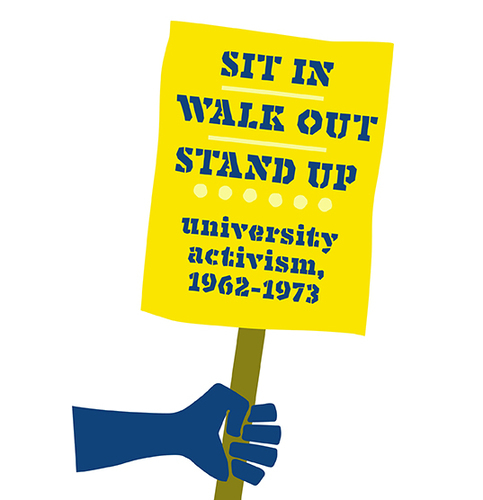 Exhibition: Sit In. Walk Out. Stand Up. To describe the year 1968—a year of assassinations, riots, war, and protests for civil and social rights—as a turning point, both at the University of Rochester and around the world, would be an understatement. But causes and effects of 1968 should not be viewed without the context of that which came before and after. At Rochester, the decade of 1962-73 changed our University no less than other institutions. Issues were both local and global. Policies were questioned and revised. Students and faculty protested directly and indirectly. Limits were tested and then retested. Some events revealed omissions at the University—in equality, diversity, and self-determination; other events affirmed the University's well-established support of free speech and academic freedom. As much as possible, this exhibition deliberately does not focus on any single event or individual. Rather than analyze, it hopes to promote discussion, to spark memories for those who were there, and to provoke questions from those who want to know what it was like. The exhibit is on view through June 1 2019, in the Great Hall on the second floor of Rush Rhees Library during building hours.